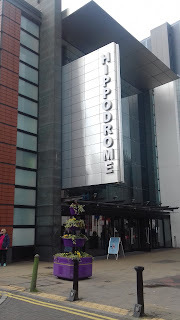 As a child I loved going to the theatre. It was something that my parents and I could enjoy together. The same however can't be said for the pop concerts my poor mother drew the short straw of having to take me to. I don't think she'll ever forgive me for the Jason Donovan concert. Not because of a lack of appreciation for the music, but more from a distinct aversion to being surrounded by hordes of screaming kids. Who can blame her? The theatre however was much more refined and dignified. Which, to be honest, was half of the appeal for them and I. It seemed such a grown up thing to do sitting on those posh red velour seats, before a huge stage with elaborate sets and costumes. The stories came to life in a way that watching a film on TV never did. It was like being part of something special. My childhood was filled with shows like; Joseph and the Technicolor Dreamcoat, Annie get your gun and the Buddy Holly Story (ok that one was Dad's choice). And then I grew up. I went to college, and University and the theatre was forgotten. Then last Christmas I went to see the Nutcracker and it was like rediscovering an old friend. Despite my years of absence, it was still just as wonderful as I remembered. Though I have made a few small adjustments... There's something indulgent about a trip to the theatre, and it seems only fitting to turn it into a day long event. A morning spent shopping, a leisurely lunch and then an afternoon matinee. It all helps to enhance the experience, honest. 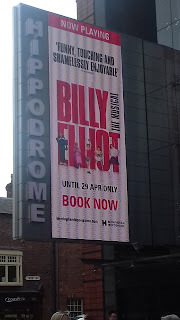 Last week I went to see Billy Elliot at the Birmingham Hippodrome. Utterly brilliant. The sets and costumes were incredible, the cast was fabulous and the choreography amazing. The dancing clothes still make me smile whenever I think of them. Last week I went to the Who Do You Think You Are? exhibition at the NEC in Birmingham. Having never been to this kind of event before I wasn't sure what to expect, other than a lot of walking and a crowd of people. I wasn't disappointed. Researching our family history has become a family affair. Turns out learning where you come from is a contagious pastime. Mum's cousin started on it a couple of years ago when she started compiling names and creating our family tree on www.ancestry.co.uk. Then her daughter joined in and their family holidays started including visits to view parish records. Another cousin sparked our curiosity by asking who these people really were. Where did they live? What did they do? Suddenly we were all scouring the genealogy websites searching for answers. The more information we found, the more it inspired us to dig deeper. Which is how I ended up at what is pitched as 'the worlds largest family history show'. It's big. My feet can attest to that. As well as the big ancestry websites and magazines, there were stands representing different regions, various workshops to attend and even experts on hand to answer questions where I'd got stuck with my research. Sadly there simply wasn't time to do everything that I would have liked, but three hours later I had a bag of leaflets, a couple of books to help me with my research and a notebook full of scribbled web addresses and people to contact. All of this research has a dual purpose, as it's inspired a new novel. It seems writing has a way of creeping into every aspect of my life. Even the past. To be fair I’d known for a while that the tree was a little wobbly and needed to be replanted much deeper, but it’s one of those things I hadn’t quite got around to. After all, it was still standing. It may have swayed frantically even in the slightest of breezes, but it was fine really. In a way storm Doris was just doing me a favour by saving me the hassle of digging the tree out myself. Not that I particularly saw it that way when I looked out of my window to find a tree sprawled across my garden. Nor have I seen it that way as I’ve clambered over said tree on the rare occasion that I’ve had to venture down the garden path. Call me ungrateful, but I would have preferred it if the tree had been left standing, swaying gently (uh hum) in the breeze. Instead, it’s forced me (eventually) to take action and deal with something that I had been very successfully avoiding until its interference. 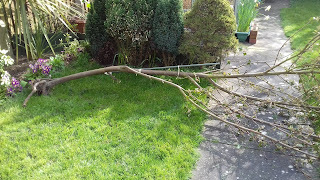 So yesterday I grudgingly headed outside, dusted the cobwebs of my scarcely used spade and dug a hole, before battling with a tree that is a lot heavier than it looks. If my neighbours find my attempts at mowing the lawn entertaining, goodness knows what they thought of the crazy women holding a conversation with a tree, issuing instructions and directions to guide it into its new home, which for the most part it chose to completely ignore. As I stood in my kitchen last night nursing my aching back, thinking how much larger my garden looks without a tree occupying half of the lawn, I gazed contentedly at my now upright tree only to discover it still sways. A lot.